Pregnancy is a very exciting time in a women’s life, whether it’s the first baby or the third. During this time a woman may see many changes in her body as her physical state will continuously change throughout gestation. The ability of a the body to alter its physical state to support and nurture the development of a baby is a miracle in itself. However, the demands of pregnancy may often lead to particular dental problems in some women and as a health conscious nation we know all about keeping our bodies in tip top shape. Why is it then, that so many of us neglect our oral wellbeing during pregnancy, especially considering that pregnancy can lead to an increased risk of gum disease and tooth decay. Recent statistics reveal that the average person’s body is 50-percent healthier than their mouths, which is strange considering the effect our teeth have on our general feeling of hygiene. It is therefore vital that we start paying the same attention to our mouths as we do our physical health, especially considering the increased risk of gum disease and tooth decay during pregnancy. The good news is that with proper hygiene at home and professional help from your dentist, your teeth should remain healthy throughout the pregnancy. So isn’t it time we introduced the latest technology to our mouths as well? By upgrading the health of your mouth and getting your oral hygiene into tip top shape you can reduce the chances of increased gum disease, tooth decay, bleeding gums – issues that many pregnant women face daily. As health conscious South Africans we know all about keeping our bodies in tip top shape and if we can use the latest gadgets to improve on our levels of fitness, then so much the better. Why is it then, that so many of us neglect our oral wellbeing during pregnancy, especially considering that pregnancy can lead to an increased risk of gum disease and tooth decay. Recent statistics reveal that the average person’s body is 50-percent healthier than their mouths, which is strange considering the effect our teeth have on our general feeling of hygiene. It is therefore vital that we start paying the same attention to our mouths as we do our physical health, especially considering the increased risk of gum disease and tooth decay during pregnancy. With this in mind, surely it’s time to upgrade the health of our mouths? “Taking care of your oral health is crucial during your pregnancy. The increased levels of progesterone and oestrogen in your body can cause gums to soften and bleed leaving you more susceptible to gum disease, sensitivity and other tooth problems. During pregnancy your blood flow also increases, which can lead to an increased blood flow to your gums that can cause complications. Many pregnant woman suffer from pregnancy gingivitis - combined gum disease and sensitivity - which left untreated could affect both mother and baby,” explains Leading Johannesburg-based Dentist, Dr Hoosen. “Research suggests that, while we are happy to spend up to an hour or more exercising, most of us do not brush our teeth for the recommended two minutes twice a day. When brushing manually, brushing performance is influenced by people scrubbing their teeth, applying too much pressure, brushing well below the recommended two minutes and at times, not brushing day and night. agrees and says Dr Hoosen. “For this reason, I often suggest that my pregnancy patients upgrade to a power toothbrush, which delivers a healthier mouth. Brushing using a power brush is more effective than using an ordinary manual toothbrush and gives a dentist-fresh feeling that is, thanks to the latest technology, easy to achieve and upgrades your oral care routine instantly,” adds Dr Hoosen. 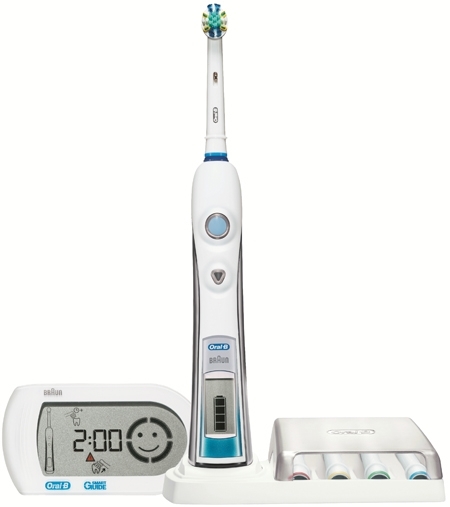 Ensuring you give your teeth two minutes of attention day and night is also made easier thanks to Oral-B® Triumph® 5000 with SmartGuide™’s power toothbrush timer, as well as a wide range of additional features for a superior clean. Furthermore, the rotating oscillating action does all the hard work for you, given that you only need to guide the toothbrush gently along your teeth and gums for an effortless clean. The Oral-B® Triumph® 5000 with SmartGuide™ also takes brushing to the next level by offering an interactive personal cleaning coaching in terms of brushing the correct length of time, giving all areas of the mouth equal attention and at the right pressure. It’s little wonder then that studies have shown that over 90-percent of people who have tried power brushing have been so impressed with the results that they will never consider going back to using a manual toothbrush. 3. Brush more thoroughly: Around 92-percent of patients significantly improved the thoroughness of their brushing within 30 days. From body fat analysers replacing basic weighing scales to the arrival of pedometers implanted in shoes which transmit speed and step information, we’ve embraced the use of gadgets to supercharge our fitness regimes. Isn’t it time we introduced the latest technology to our mouths? Upgrade the health of your mouth and get your oral hygiene into tip top shape today. 1. Looking after our health and wellbeing is made easier with technology. Innovations such as body fat analysers replace basic weighing scales, while the arrival of pedometers implanted in shoes that transmit speed and step information help to supercharge fitness regimes. Now more than ever before, we understand the positive impact that technology can bring to our lives – so why not extend this to upgrade our oral health? Today’s busy individuals are always on the lookout for the latest gadgets to simplify their lives, Oral-B® Triumph® 5000 with SmartGuide™ power brush allows you to get that ‘dentist clean’ feeling every single day, without any extra effort. 2. Oral-B’s power toothbrushes use oscillating-rotating technology that has been clinically proven to remove twice as much plaque as manual toothbrushes. The increased efficiency of the brushing action also keeps other oral health problems at bay, helping you to prevent the buildup of tartar, plaque, cavities and gum problems. • 90-percent of people who have tried power brushing have been so impressed with the results that they will never consider going back to using a manual toothbrush. Four billion times a day, P&G brands touch the lives of people around the world. The company has one of the strongest portfolios of trusted, quality, leadership brands, including Pampers®, Tide®, Ariel®, Always®, Whisper®, Pantene®, Mach3®, Bounty®, Dawn®, Gain®, Pringles®, Charmin®, Downy®, Lenor®, Iams®, Crest®, Oral-B®, Duracell®, Olay®, Head & Shoulders®, Wella®, Gillette®, Braun® and Fusion®. The P&G community includes approximately 127,000 employees working in about 80 countries worldwide. Please visit http://www.pg.com for the latest news and in-depth information about P&G and its brands.